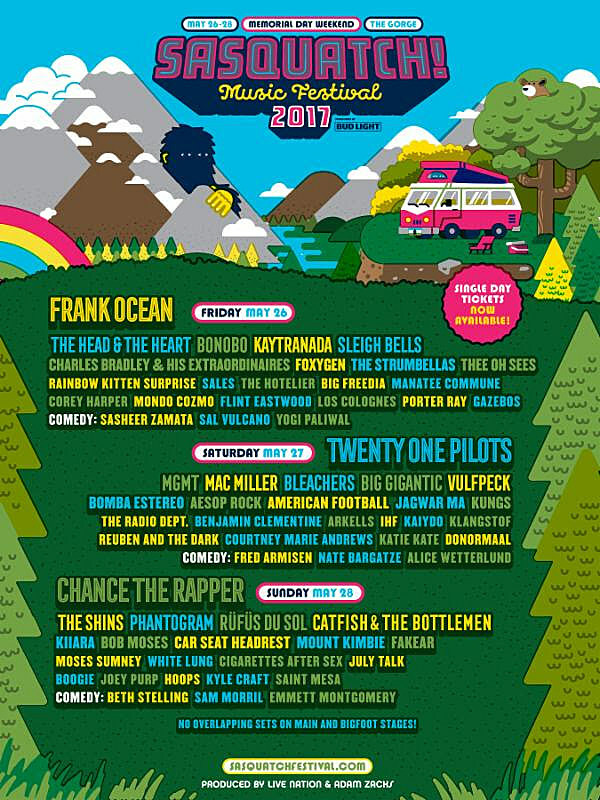 The daily lineups have just been announced for Washington State’s Sasquatch! Festival, which returns May 26-28. Single-day tickets also go on sale today (2/27) at 10 AM PST. The fest also added a few new artists, including Sleigh Bells and Benjamin Clementine. Frank Ocean headlines the Friday, which also has Sleigh Bells, Kaytranada, Charles Bradley, Foxygen, The Hotelier, Big Freedia and more. Twenty One Pilots headline the Saturday, which also has MGMT, Aesop Rock, American Football, The Radio Dept, Benjamin Clementine and more. Chance the Rapper headlines the Sunday, which also has The SHins, Phantogram, Car Seat Headrest, Mount Kimbie, White Lung, Joey Purp and more.